Now we have a new challenge! I found three of them at a yard sale for 25¢ a piece ages ago and they’ve just been sitting in my garage ever since. 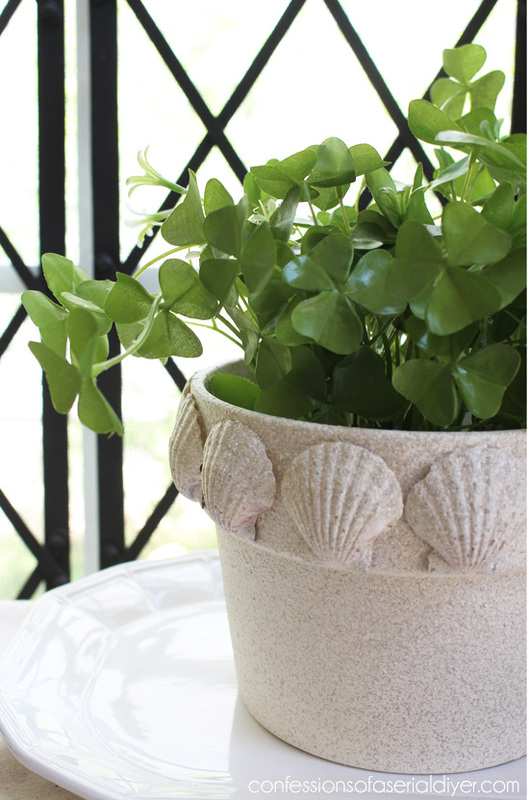 With the Summer rolling in I’ve been enjoying adding a few beachy elements to my spaces lately. 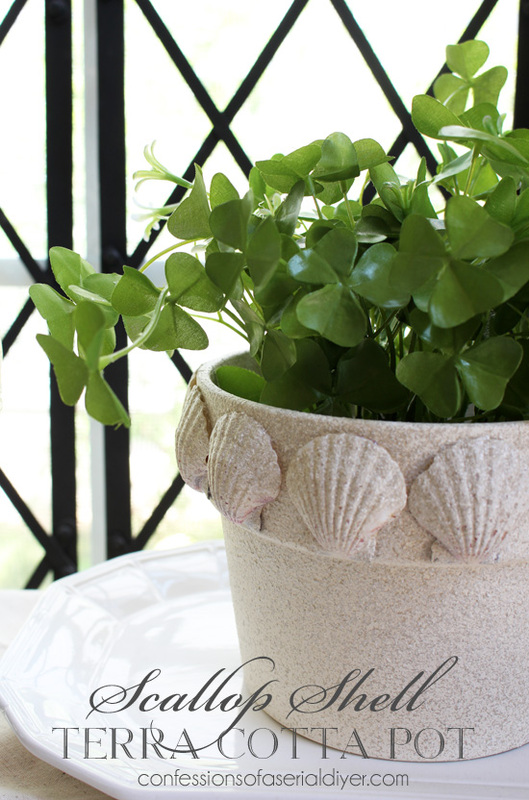 It started with that basket and then I created this Shell wreath, and this fun shell garland for my fireplace. So why not keep the theme going? This could not have been easier! I’ve included a few affiliate links so you can find the products I used. 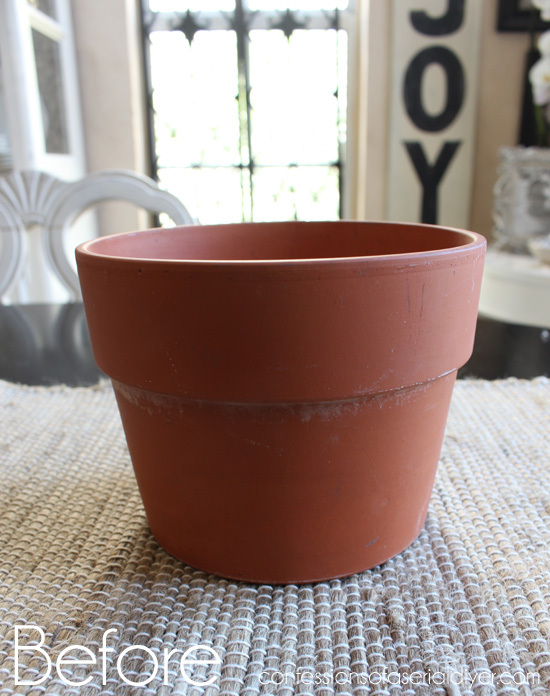 I started by painting my pot. I used latex paint as a base. 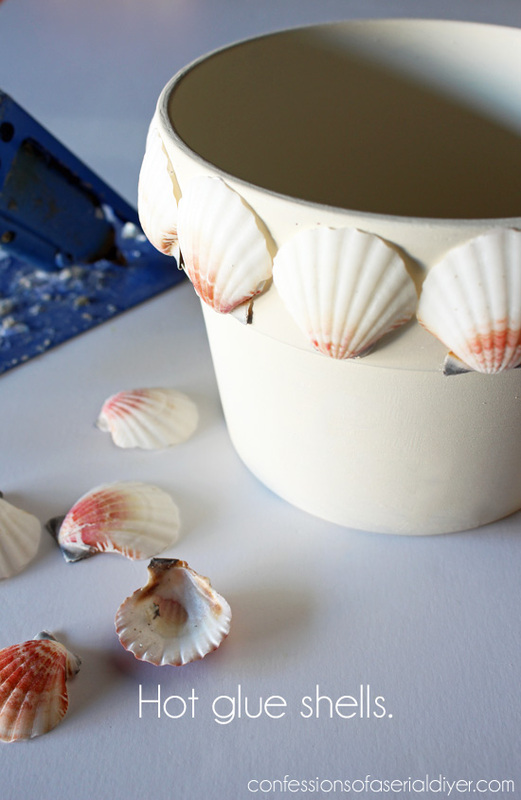 I had a ton of scallop shells left over from my other shell projects. They came in a pretty good sized bag from TJ Maxx. You can also find them HERE. I thought they’d be perfect to add around the top. 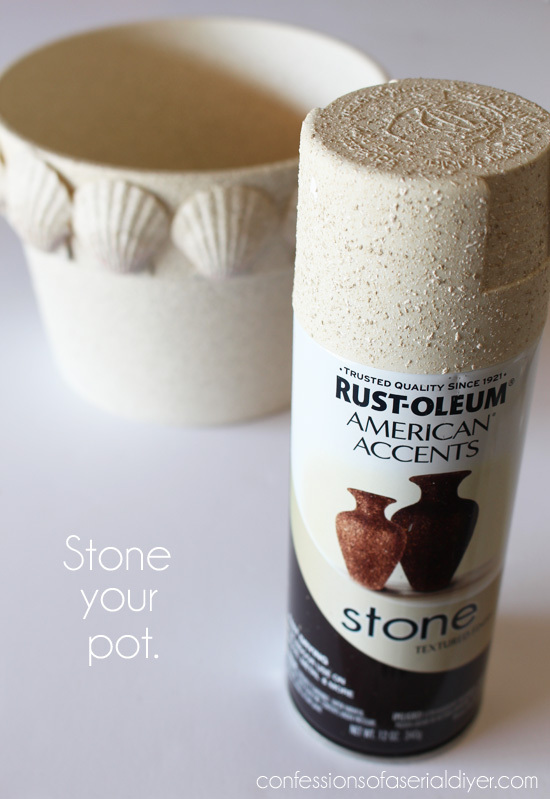 I had this faux stone spray paint left over from my Thrifty Fall Centerpiece, and thought it would look like sand! It kinda does a little. That’s it! 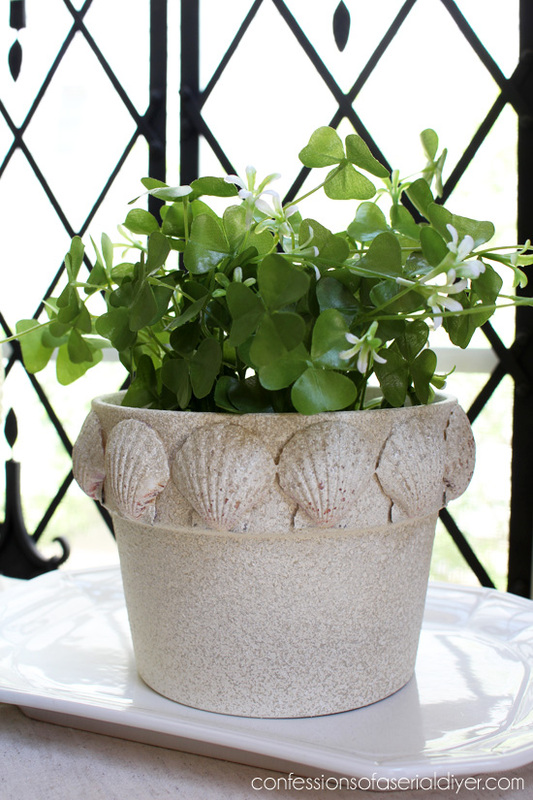 I didn’t seal it or anything since I was only adding a faux plant, but I don’t think you have to anyway. 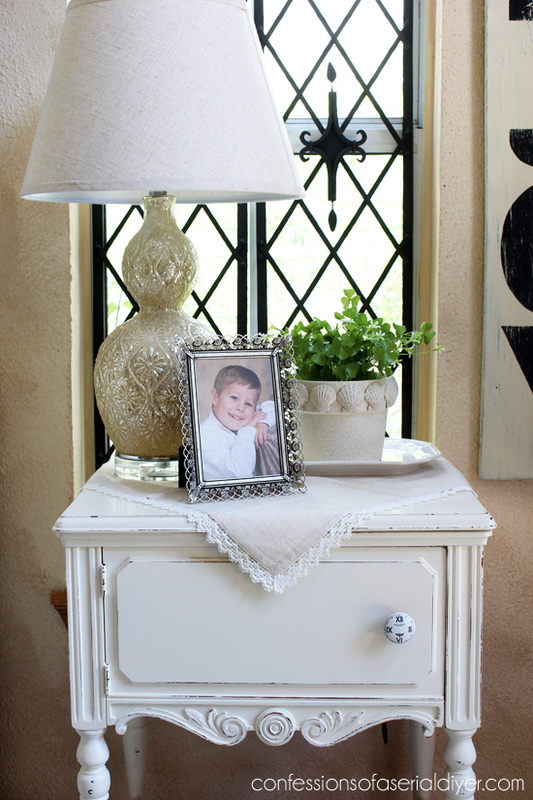 This little $20 dollar yard sale table usually lives over by my back sliding glass doors, but I had the yard sale hutch I shared on Tuesday set up there to take pictures, so this little guy ended up in my dining room to get his picture taken. This is actually a sewing machine table. That’s my little cutie in preschool. He’ll be starting 8th grade in the Fall, sniff sniff. 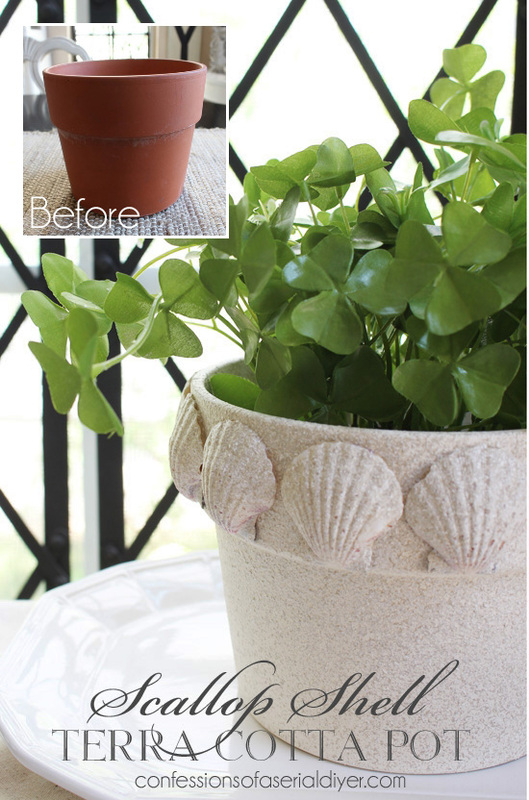 Just one more fun way to transform a plain old terra cotta pot! 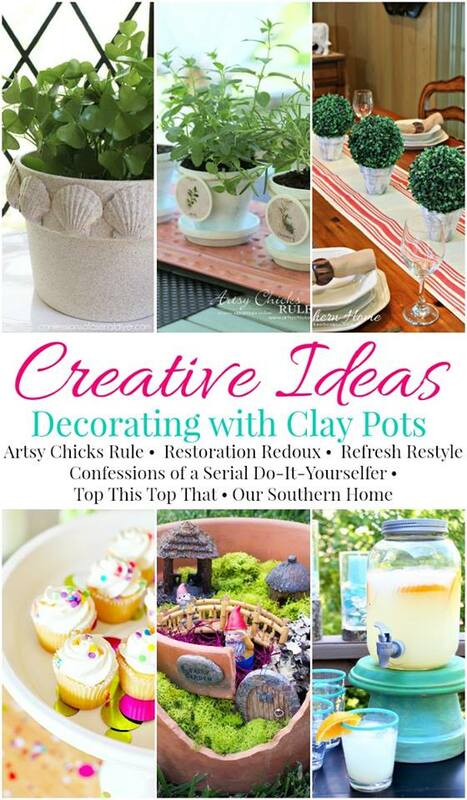 Be sure to visit these fabulous ladies below and see what they did for our Clay Pot challenge!! So many fun ideas! 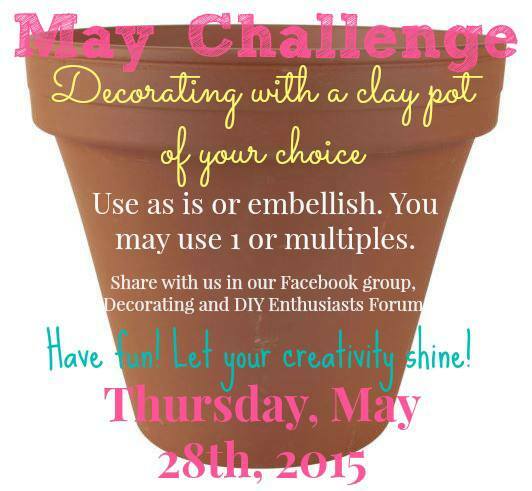 Next month’s challenge will be decorating with trays…easy! 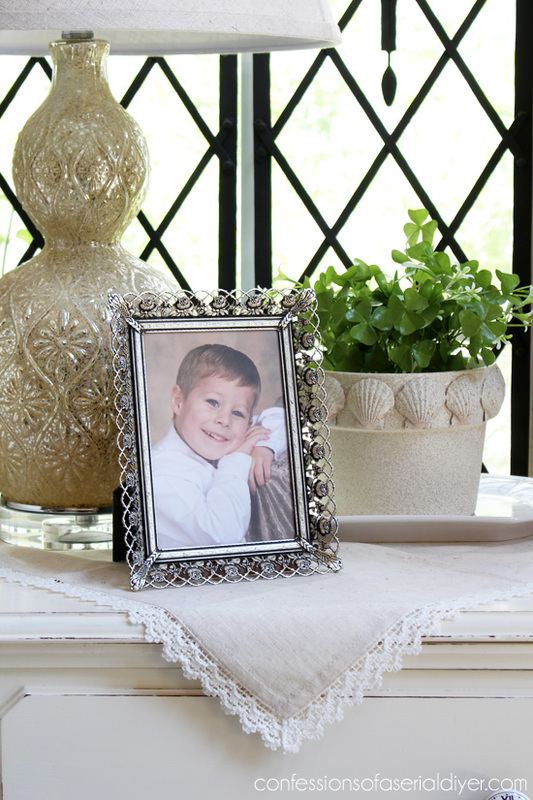 UPDATE: Check out why trays are one of my favorite decorating tools HERE now! Great idea and the stone paint looks like sand! 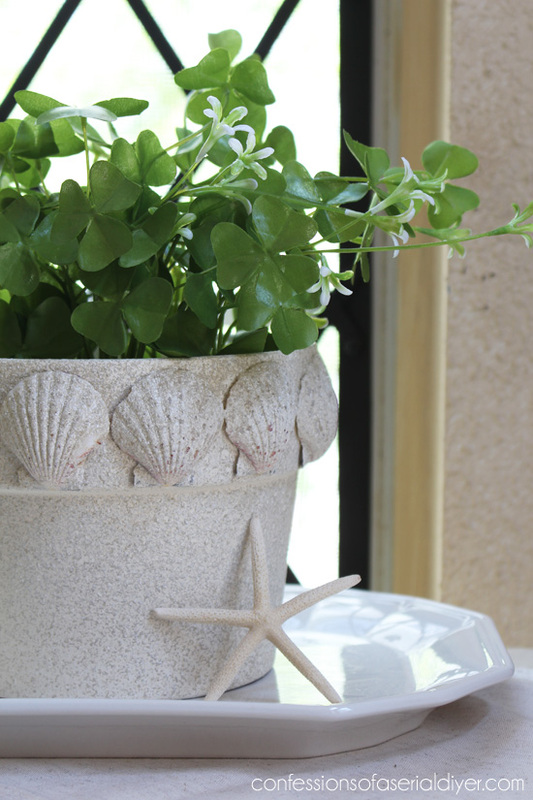 Perfectly beachy! Love it! 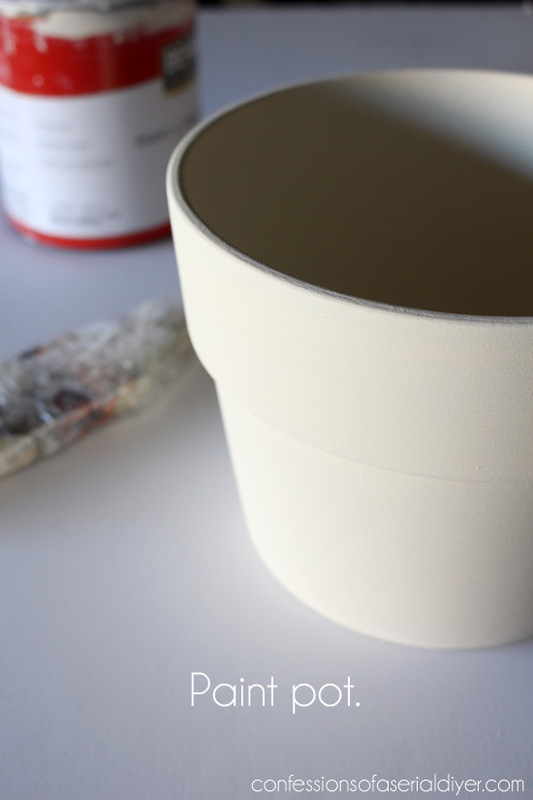 Love how your clay pot turned out! Love the sandstone finish-looks like a million! super cute and perfect for this this time of the year. I have never used that stone spray. wow, it really does transform the look. 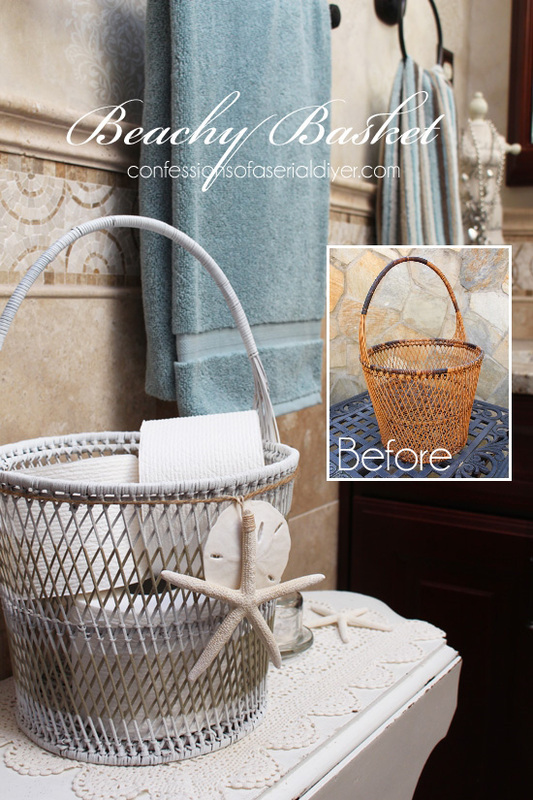 Love it Christy – using the speckle paint is perfect! And…that lamp is so pretty. I don’t remember seeing it at your house when I was there! I love it! BOOO!!! how come you got all the creative genes!!!! not fair…but it is nice you share!!! !